This past spring I was assigned to teach an undergraduate class on 18th Century and Romantic Aesthetics. In other words, I was tasked with teaching the history of a philosophy that created the term “Taste” as a means of defining the “universal” human subject as a white European male. This I had to do during a semester that began with the protests in Ferguson and ended with the protests in Baltimore. 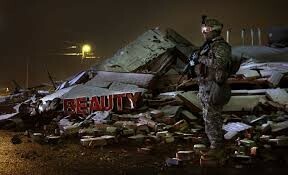 When writing my syllabus, I discovered images of the destroyed Beauty Supply store in Ferguson and used it as the document’s header. I chose another of these images for the header here. The photos for me signal the clarity of a historical narrative from the European Enlightenment to today’s America, a narrative in which poetic practice is deeply implicated. As I taught, that narrative was always in my mind. It’s what I want to flesh out here. For the last twenty-five years of my life, or, since I left high school, I’ve struggled to find an adequate definition of POETRY. Not being able to get on with it, so to speak, is in many ways due to my own shortcomings as a person and thinker. Nevertheless not being able to get on with it, I think, had a lot to do with being a young person in the shadows of certain avant-gardes. I’m hoping that the story of getting from Immanuel to Zora will also be in part the story of coming out of those shadows. So this is just to say I am here for a little while and this is what I’ll be doing while I’m here. See you in a few days.